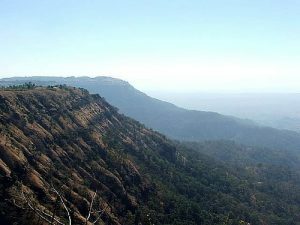 Melghat Tiger Reserve is located on southern offshoot of the Satpura Hill Range in Central India, called Gavilgarh hill in the Indian state of Maharashtra. The high ridge running east-west which has its highest point at Vairat (1178 m. above msl. ), forms the southwestern boundary of the Reserve. It is a prime habitat of the tiger. The forest is tropical dry deciduous in nature, dominated by teak Tectona grandis. The Reserve is a catchment area for five major rivers viz. Khandu, Khapra, Sipna, Gadga and Dolar, all of which are tributaries of the river Tapti. The northeastern boundary of the Reserve is marked by the Tapti river. Melghat is the prime biodiversity repository of the state. The sudden slope of Melghat form the part of catchment of river Purna. The three major tributaries originating from Melghat region and draining into river Purna are Chandrabhaga, adnani and wan. Chikhaldara is located on high sudden platau at an altitude of 1100 ms. above MSL. Nature has offered protection to Melghat in the form of a rugged topography with only a few entry points. The Makhala, Chikhaldara, Chiladari, Patulda and Gugamal are the large plateaux amidst rugged terrain. Contiguity of forests in Satpura Hill Range guarantees the long-term conservation potential of the area. Conservation History : Melghat area was declared a Tiger Reserve in 1974. Presently, the total area of the Reserve is around 1677 sq. km. The core area of the Reserve, the Gugarnal National Park with an area of 361.28 sq. km., and buffer area of the Reserve, the Melghat Tiger Sanctuary with an area of 788.28 sq. km. (of which 21.39 sq. km. is non-forest), were together re-notified by the state government in 1994 as Melghat Sanctuary. The remaining area is managed as a ‘multiple use area’. Previously, Melghat Tiger Sanctuary was created in 1985 with an area of 1597.23 sq. km. Gugarnal National Park was carved out of this Sanctuary in 1987. Archaeological Richness : The Gavilgarh fort on the Chikhaldara plateau and Narnala fort abetting southeastern part of Melghat Tiger Reserve add to the aesthetic value of the area. Visitors to these archaeological monuments enjoy the serene forests in the backdrop. 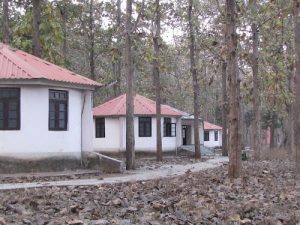 Semadoh is a village located in dense Melghat Tiger Reserve in Dharni Tahsil, Amravati District, Maharashtra.Near Semadoh on the banks of Sipna River is a Forest Jungle camp consisting of four Dormitories (60 Bed) and Ten cottages (20 bed). The cottages have been recently renovated and are in good condition. There is a museum next to cafeteria (mess). Most important is presence of wild life in the area like Tigers, Sloth bear, leopards and other jungle animals. Bookings can be done though Forest Department Amravati.